Canadian Prime Minister Justin Trudeau, left, and Mexican President Enrique Pena Nieto shakes hands during a meeting at the Palacio Nacional in Mexico City on Oct. 12, 2017. How the visit unfolded • Meet Enrique Pena Nieto • Previously, in Washington • NAFTA: What will Mexico do next? Prime Minister Justin Trudeau’s NAFTA goodwill tour wrapped up in Mexico City Friday, after he and the Mexican President vowed not to hastily walk away from the negotiating table for the trilateral trade deal. Mr. Trudeau gave a speech to the Mexican Senate on Friday morning, speaking about the North American free-trade agreement and Canada-Mexico relations and appealing to senators to do more to advance women’s rights in the country. Mr. Trudeau arrived in the Mexican capital on Thursday to meet with President Enrique Pena Nieto on his first official visit to the country. At a news conference Thursday, the leaders said they were still committed to the NAFTA talks despite hardline positions taken by U.S. President Donald Trump, who threatened earlier this week to rip up the deal if his administration isn’t happy with it. But behind the scenes, Canadian officials told The Globe and Mail they are growing increasingly doubtful that a deal can be struck. At NAFTA talks in Arlington, Va., the Americans have proposed major changes to one of Mexico and Canada’s more contentious issues: Auto manufacturing. Auto industry and government sources told The Globe that the U.S. wants at least 85 per cent North American content and 50 per cent U.S. content in duty-free vehicles. The current rule is 62.5 per cent North American content. 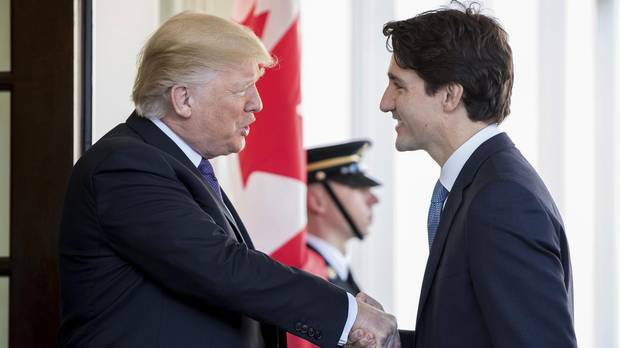 Mr. Trudeau flew to Mexico City from Washington, where, after a meeting with Mr. Trump on Wednesday, the Prime Minister acknowledged for the first time that the 23-year-old NAFTA deal could fall apart. Here’s a full primer on what Mr. Trudeau said and did in the U.S. capital. Mr. Trump was ambivalent about whether a deal could be reached. He also hinted that he might pursue bilateral deals with either Mexico or Canada. The fourth round of NAFTA talks is under way in Virginia until next Tuesday. Here’s a primer on the issues behind the talks and what the countries are asking for. Mr. Trudeau and his wife, Sophie Grégoire Trudeau, arrived in Mexico City shortly before noon local time (1 p.m. ET) on Thursday, welcomed by Foreign Minister Luis Videgaray. The pomp and circumstance that greeted Mr. Trudeau at the airport was followed by a sombre wreath-laying ceremony at a monument commemorating Mexico's efforts to beat back an American invasion in the 1850s – an apt image as both Canada and Mexico now contemplate how to withstand new U.S. strong-arming efforts over trade. 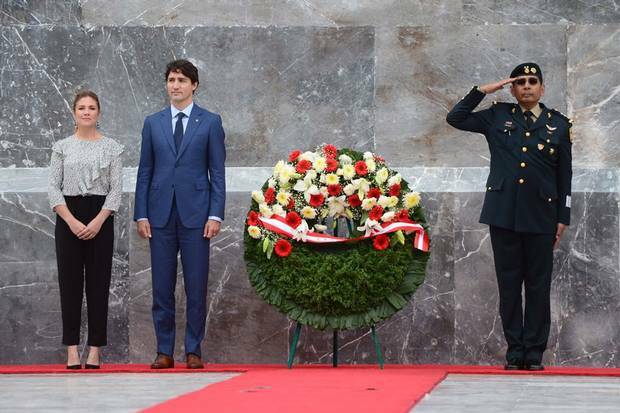 The Trudeaus attend a wreath-laying ceremony at the Ninos Heroes monument in Mexico City’s Chapultepec Park. The Trudeaus then stopped by a Red Cross aid distribution centre, donning volunteer vests and handing over boxes of baby goods, foods and household supplies for earthquake relief efforts. Later that afternoon, Mr. Trudeau went to the National Palace for extended bilateral talks with Mr. Pena Nieto. The leaders talked with their aides and then their foreign affairs and trade teams for close to two hours. While the two sides were discussing a range of issues, the ongoing talks to rework NAFTA were a large part of the discussion. 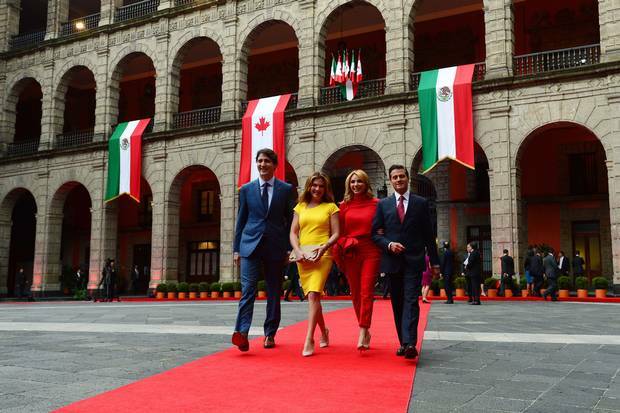 Mr. Trudeau, Ms. Grégoire Trudeau, President Enrique Pena Nieto and his wife, Angelica Rivera, leave the official welcoming ceremony at the National Palace. We will continue to take very seriously the work we do and we will not be walking away from the table based on proposals put forward. We will discuss those proposals, we will counter those proposals and we will take seriously these negotiations. I would not pay much attention to any statements other than that which happens (at) the negotiation tables. 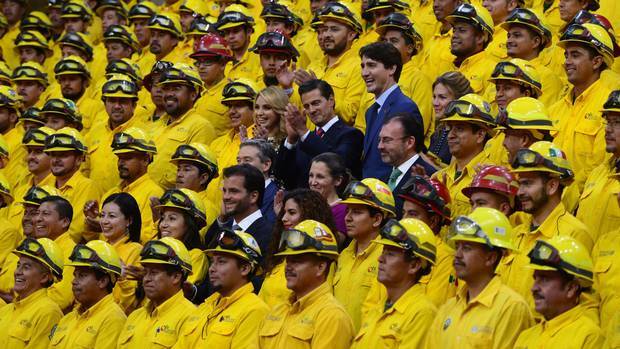 At the news conference, Mr. Trudeau, Mr. Pena Nieto, their wives and ministers take part in a photo op with Mexican firefighters, who helped to fight Canadian forest fires. 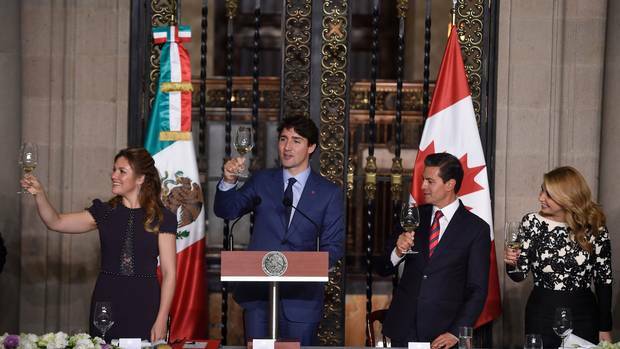 The Canadian and Mexican leaders and their wives make a toast at the National Palace. The negotiations so far, with the exception of the easy stuff, are not going well. They are not going well because you are negotiating a free-trade agreement with a protectionist Donald Trump. It is the most protectionist administration since the early 1930s. Isolationism is taking hold in too many corners of the world, but our people must not succumb to fear. We, as leaders, must not succumb to fear. Our challenge lies in ensuring that everyone benefits from economic growth. And we do that by pursuing an ambitious, progressive vision of what the future can — and should — look like. Violence against women and girls is prevalent in all facets of life, from the studios of Hollywood to the digital public squares, our halls of Parliament. As a gender-balanced Senate, I challenge you to use your position and power to strongly push for the rights of women and girls in Mexico and around the world. 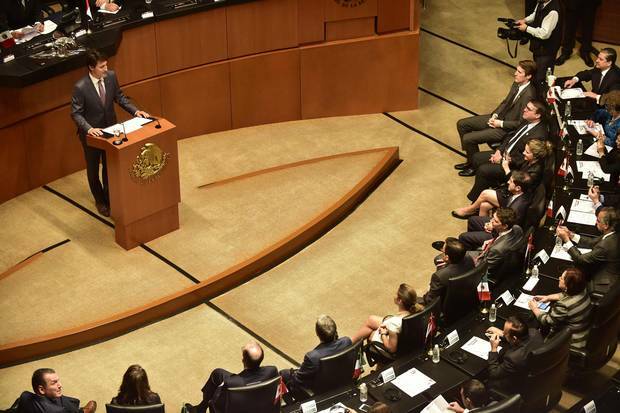 Mr. Trudeau delivers a speech during his visit to the Mexican Senate. 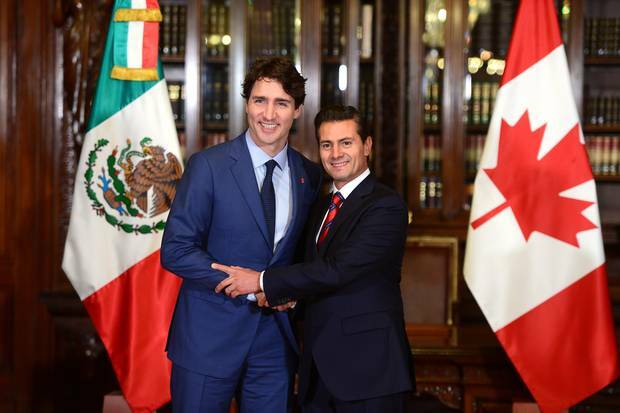 Mexico's President is a long-standing ally of Mr. Trudeau's, with similar views on free trade. This is the Prime Minister's first official visit on Mr. Pena Nieto's home turf; Mr. Pena Nieto made a state visit to Canada in June, 2016. Donald Trump's rise to power has been a difficult test for Mr. Pena Nieto, who has had to walk the line between alienating his country's biggest trading partner and giving in to a politician who has disparaged Mexico often and wants to build a border wall. Last summer, Mr. Pena Nieto's decision to invite Mr. Trump, then still a presidential candidate, to Mexico backfired badly as media and political opponents accused him of trying to appease a national adversary. 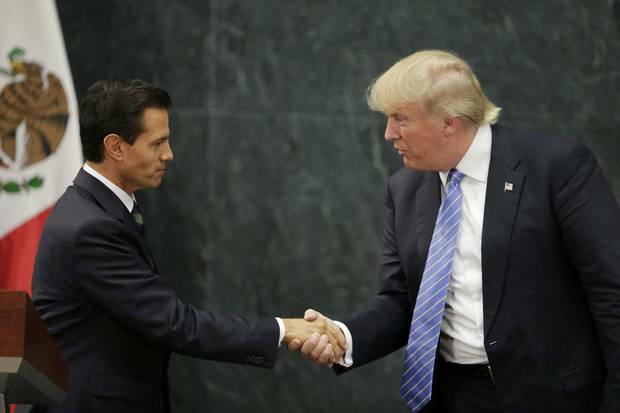 Aug. 31, 2016: U.S. Republican presidential nominee Donald Trump shakes hands with Mr. Pena Nieto shake hands at a press conference at the Los Pinos residence in Mexico City. In January, Mr. Pena Nieto cancelled a visit to Washington after the White House proposed a 20-per-cent import tax to pay for the wall. 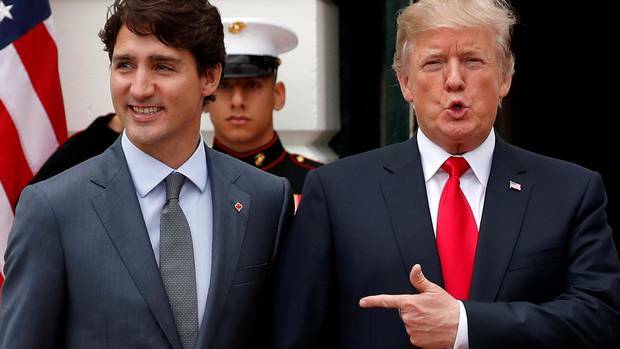 Relations between the two leaders gradually softened; in August, a phone call from Mr. Pena Nieto, and another from Mr. Trudeau, persuaded the President to back off from threats to terminate NAFTA immediately. The Trump era has been disastrous for Mr. Pena Nieto's fortunes in the polls. In the most recent Pew Research Center poll, only 28 per cent of Mexicans expressed a favourable opinion of him, with 80 per cent disapproving of how he has handled the economy. But Mr. Pena Nieto won't have to deal with his mercurial U.S. counterpart much longer: His term ends next year, with Mexicans voting for a new president on July 1. The perceived front-runner, Andres Manuel Lopez Obrador – nicknamed "Amlo," from his initials – is a left-wing, populist and stridently anti-Trump candidate. The election is one reason for the aggressive U.S. timetable in renegotiating NAFTA: The Trump administration wants a new deal locked in by the end of the year. 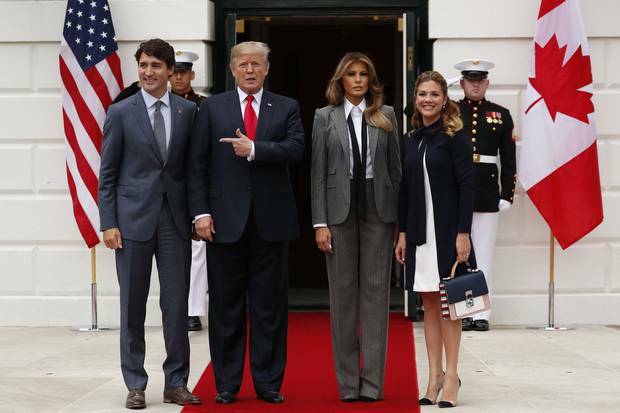 Canadian Prime Minister Justin Trudeau, left, and his wife, Sophie Grégoire Trudeau, right, are welcomed to the White House by U.S. President Donald Trump and first lady Melania Trump on Oct. 11, 2017. I think Justin understands this, if we can't make a deal, it will be terminated, and that will be fine. They're going to do well and we're going to do well. But maybe that won't be necessary. But it has to be fair to both countries. I think Canadians are aware that the American administration, and the President, makes decisions that surprise people from time to time. And that is certainly something that we are very much aware of, and very braced for, and conscious of. We know that there is a certain level of unpredictability these days. Some of us in Mexico think that on several occasions our Canadian friends have come close to throwing us under the bus. How do we Mexicans ensure [our] Canadian friends stay focused on a trilateral approach? NAFTA: What will Mexico do next? In the NAFTA negotiations, Mexico and Canada have been fighting back against protectionist proposals by the Trump administration – some of which, critics suggest, are designed to make them balk and walk away from the deal. Proposals such as a five-year sunset clause are a "poison pill" with which the Trump administration intends to kill the deal, explained Thomas Donohue, president of the U.S. Chamber of Commerce, to a Mexico City audience Tuesday. We have to be prepared to say no, and if necessary to get up from the table and if necessary leave the treaty. It would not be the end of the world. Mexico's position will continue to be serious and constructive, but we have also been very clear about the fact that we rather leave the negotiating table than [accept] a harmful deal. NAFTA's Article 2205 lets any member country announce their withdrawal from the deal with six months' notice. Mr. Trump has threatened to do this several times, though he's sometimes framed it as a negotiating tactic to force Canada and Mexico's hand rather than a final move. Uncertainty about NAFTA's fate has been driving down the Mexican peso against the U.S. dollar in recent weeks. In Mexico City on Thursday, Mr. Pena Nieto indicated he was paying attention to the suggestion by Mr. Trump that, if NAFTA talks fail, bilateral deals could be negotiated instead. Afterward, Mr. Trudeau didn't rule out the notion, and Mr. Pena Nieto said he did discuss it with the prime minister Thursday. The government of Mexico will keep working constructively with Canada to further strengthen our relations, achieve mutual benefits and contribute to reaching our shared goal: to make North America the most prosperous and competitive region in the world. ... I am convinced that this vital junction for Canada-Mexico relations will translate into more and better opportunities for our countries. No more NAFTA: How Canada could thrive without the trade pact Terminating NAFTA is the nightmare scenario long feared by many Canadians after almost three decades of free trade with our southern neighbour. Or is it? Barrie McKenna investigates.